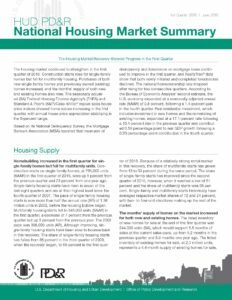 Although the U.S. homeownership rate fell slightly in the first quarter of 2016, the housing market overall showed signs of improvement, led by modest gains in single-family construction starts, single-family home sales and the highest levels of home equity held by American households since the fourth quarter of 2006, according to the National Housing Market Summary published by HUD’s Office of Policy Development & Research. Construction starts on single-family homes were up 5% from the fourth quarter and 23% from one year before. Having risen in seven of the last eight quarters, single-family starts are now at their highest level since the fourth quarter of 2007. Purchases of new single-family homes were up 5% from the fourth quarter and up 2% from one year earlier. Sales of existing homes were up 2% from the fourth quarter and up 5% from one year earlier. The number of underwater borrowers declined by 1 million for all of 2015, and homeowners’ equity increased by nearly $1.2 trillion. Since the beginning of 2012, the number of underwater borrowers has fallen 64%, from 12.1 to 4.3 million. The U.S. Homeownership rate declined 0.3 percentage points in the first quarter after increasing for two consecutive quarters. Aside from the second quarter of 2015, the current 63.5% homeownership rate is the lowest since the fourth quarter of 1985. The Federal Reserve reported homeowners’ equity rose $360 billion in the fourth quarter of 2015, reaching more than $12.5 trillion, the highest level since the fourth quarter of 2006. Homeowners’ equity peaked at nearly $13.3 trillion in the first quarter of 2006 during the housing bubble. The change in homeowners’ equity for all of 2015 was nearly $1.2 trillion, or 10.2%.